Monte Carlo Blackjack - Play $€£ 5 Free! Do you ever wish blackjack was a faster game to play? Monte Carlo Blackjack is the game for you, in this high-action game you play three hands at the same time. Blackjack is definitely a classic casino game. Many modern gamblers tend to shy away from it though, as it’s not the fastest game on the planet. Compared to slots, playing Blackjack can be slow. This is unfortunate, as blackjack has some of the best payout percentages of any casino games! Nextgen Gaming has stepped in to cure blackjack from being too slow. Its new game Blackjack Pro Monte Carlo Multihand is without a doubt the fastest playing blackjack game at Pokies.com casinos. In fact, the slowest thing about the game is saying its outlandishly long name out loud! What makes Blackjack Pro Monte Carlo Multihand different from most other blackjack games, including live dealer games, is that it’s easier to play multiple hands at the same time. When you play three hands at the same time, you get three times the action! 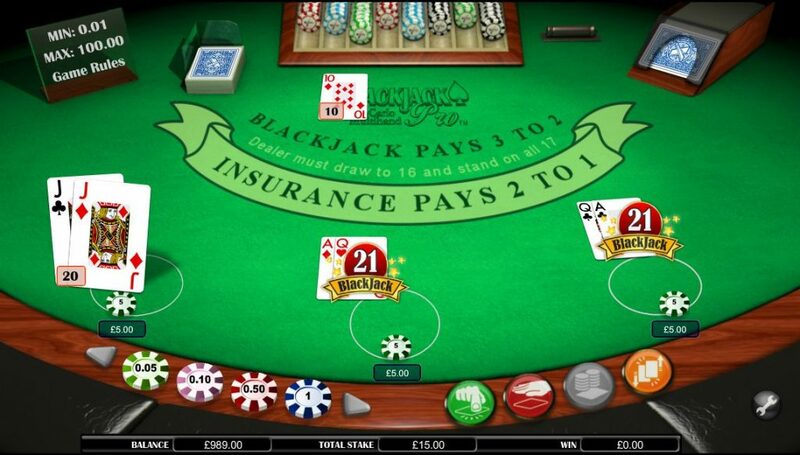 Other than its multi-hand function, Blackjack Pro plays like any other high-quality BJ-game. You get to hit, stand, split, double down as per your own strategy. Blackjack Pro Monte Carlo Multihand is fully mobile. Nextgen prides itself in making some of the best mobile online casino games and this one is no exception. The game plays equally well on your computer or mobile device. All iPhone, iPad and Android tablets and phones are good for gaming. Sign up now and get a taste of real-money action. As a new player, signing up at top online casinos, you get free bonuses simply by signing up and depositing. You can use this bonus money on any games you like: blackjack, roulette, slots… So, there is no better time to sign up than right now! If you are already a member at a casino that offers Nextgen games, log in to see what new bonuses are coming your way today.